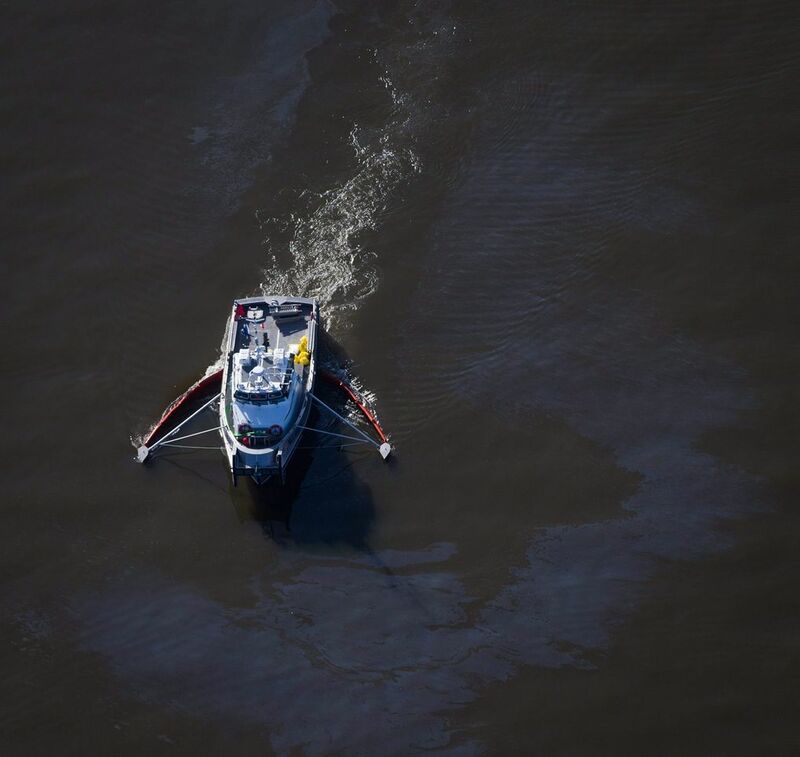 A spill of bunker oil Wednesday evening in Vancouver, B.C., wasn’t reported to Vancouver officials until 12 hours after the Coast Guard was first alerted to the problem, raising concerns about the rate of response in an emergency. VANCOUVER, B.C. 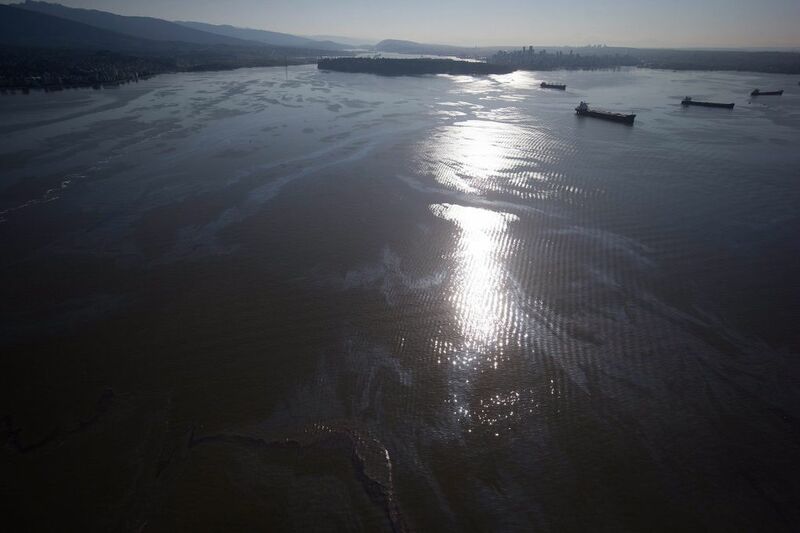 — A spill of bunker oil Wednesday evening in Vancouver, B.C., wasn’t reported to Vancouver officials until 12 hours after the Coast Guard was first alerted to the problem, raising concerns about the rate of response in an emergency. 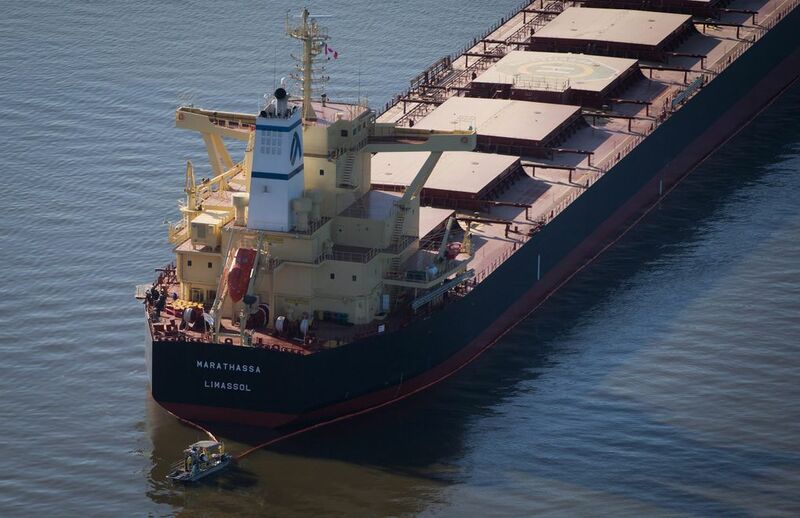 While someone from a sailboat first reported the estimated kilometer-long oil slick at about 5 p.m. to Port Metro Vancouver, the Canadian Coast Guard didn’t start containing the area until 8 p.m., when crews in five boats from the West Coast Marine Response Corp. set up a boom around the ship Marathassa, a bulk grain carrier from Korea, and then worked throughout the night to recover some of the heavier oil around the ship and pinpoint its source. The city, however, was not informed of the slick until 6 a.m. the next day, at which time it activated its emergency operations center, calling on marine units from the Vancouver Police and Fire and Rescue officers, as well as city staff and park rangers to monitor the shoreline, and biologists and wildlife experts to assess any risks to the shoreline and wildlife. “We’re here to help and support. We need to be an integrated part of any response,” city manager Penny Ballem said. At a news conference held at English Bay Thursday morning, City Councilman Geoff Meggs also voiced concerns about the delay in alerting the city. Meggs said while the spill may be considered a minor event by federal authorities, it is a huge deal to the people of Vancouver. 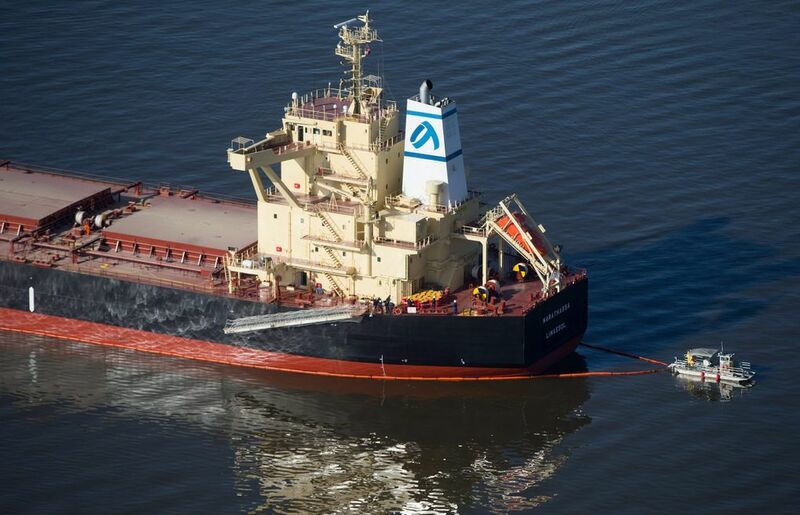 A total of 1,400 liters of oil has already been recovered by crews cleaning up the toxic fuel spill believed to have leaked from the freighter Wednesday afternoon. The Coast Guard estimates as much 2,800 liters (about 740 gallons) escaped. 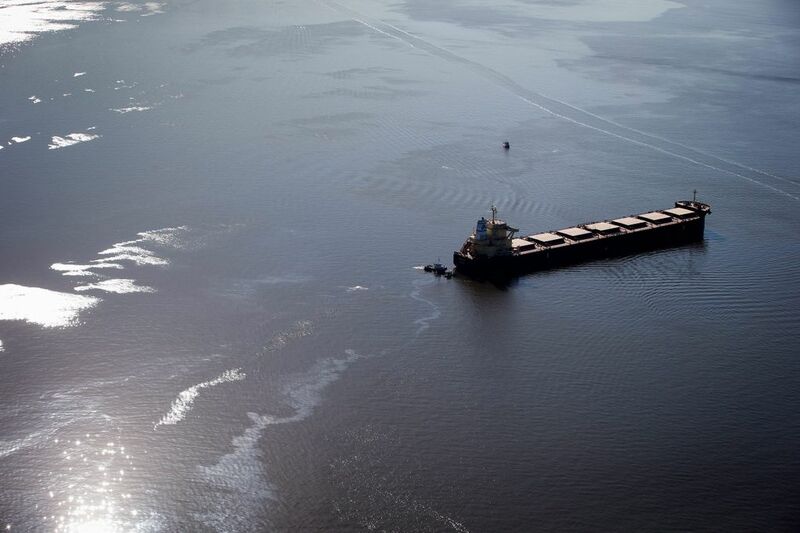 Julia Ren, spokeswoman for Port Metro Vancouver, said if the ship is found to have caused the spill, it would likely be responsible for all clean-up costs under Canada’s polluter pays principle, which means a shipper is liable for costs if it causes marine pollution. Rob O’Dea, a sailor who reported the spill, said he was surprised the response hadn’t been quicker. O’Dea was sailing in English Bay at about 5 p.m. when he noticed a half-kilometer section of flat water amid the windswept waves. As he sailed closer, he realized the slick wasn’t just on the surface but deep beneath the water. He called the Coast Guard, but noted there was not an emergency response on scene until at least an hour later when a harbor patrol boat appeared and went back and forth through the slick. By 8 p.m., he said, the slick still hadn’t been contained. Ironically, O’Dea added, the slick had occurred in sight of the now-closed Coast Guard Station. Vancouver West End New Democrat MLA Spencer Chandra Herbert said he was concerned that people and their dogs were swimming at English Bay without being informed that a toxic fuel spill had happened. 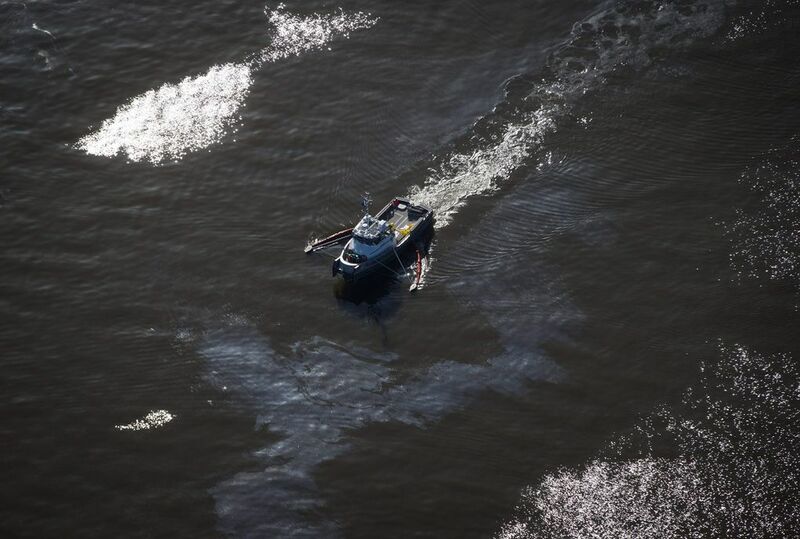 Coast Guard spokesman Dan Bate said it wasn’t until the organization took an aerial view of the site that it realized the size of the spill was much larger than first thought. 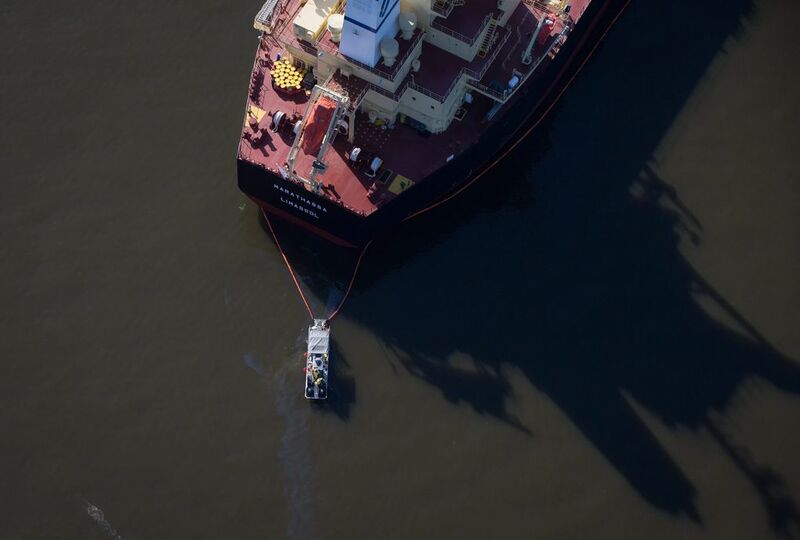 Crews from five West Coast Marine Response Corporation boats used skimmers Thursday to try to recover some of the oil surrounding the ship, though Port Metro Vancouver stressed that it has not been confirmed that the oil is from that ship. 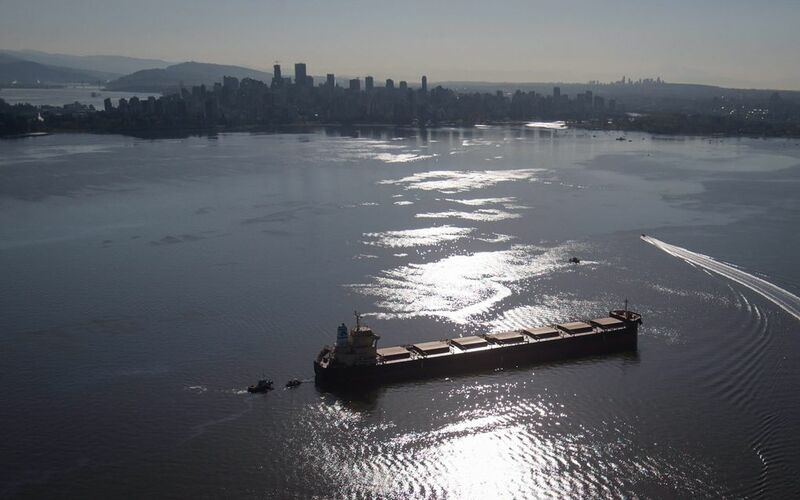 Bate wouldn’t confirm the identify of the oily substance but Vancouver city officials posted a boater and watercraft alert on Twitter early Thursday, saying that the spill is believed to be bunker fuel and that it is toxic. They are warning people not to touch the fuel. Ballem said the oil still being tested to confirm it is bunker fuel. Bunker fuel is a type of liquid fuel used on ships which is fractionally distilled from crude oil. It is extremely crude and highly polluting. Aerial photos show a sheen on the water out in the bay stretching to the shore, but at Kits and Sunset beaches Thursday morning, there was little evidence of an oil spill. Several residents out walking their dogs said they hadn’t seen any oil on the beach. However, several people posted photographs on social media websites showing a sticky oil residue on their hands, and one user posted a video showing what appears to be an oily substance on the water’s edge at the north end of English Bay. There were no signs up warning about the spill at the beaches, though city staff were out speaking to people about the incident. All affected beaches remained open Thursday. Bate said there are no confirmed reports that the oil has reached the shores of the local beaches. 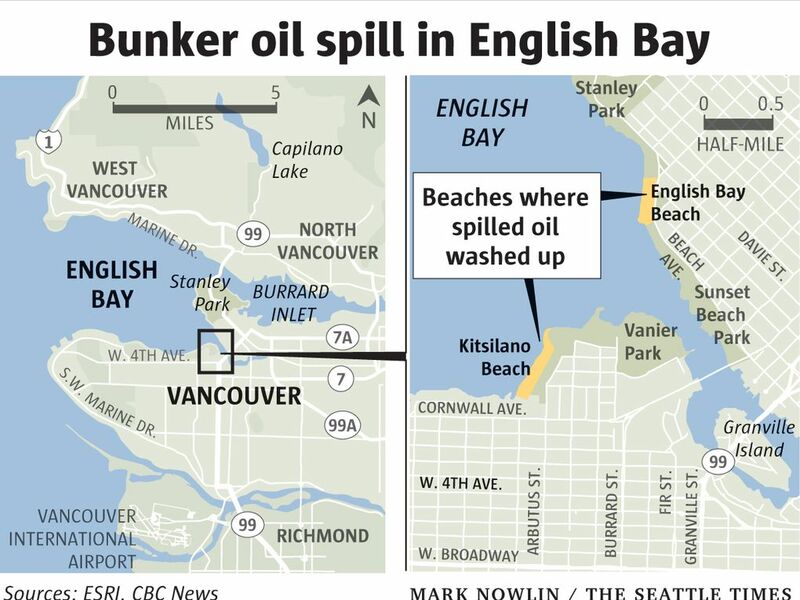 Yet the Vancouver park board says oil has been seen on Sunset Beach as well as English Bay, while four oil-covered ducks were seen preening themselves between Second and Third Beach on the shore in Stanley Park. Park Board chairman John Coupar said he noticed traces of the oil on the seawall when the tide came in at 8:25 a.m. but said the spill doesn’t seem to have affected Spanish Banks or Jericho. The Burrard Civic Marina at the mouth of False Creek also seems to have escaped unscathed, he said. 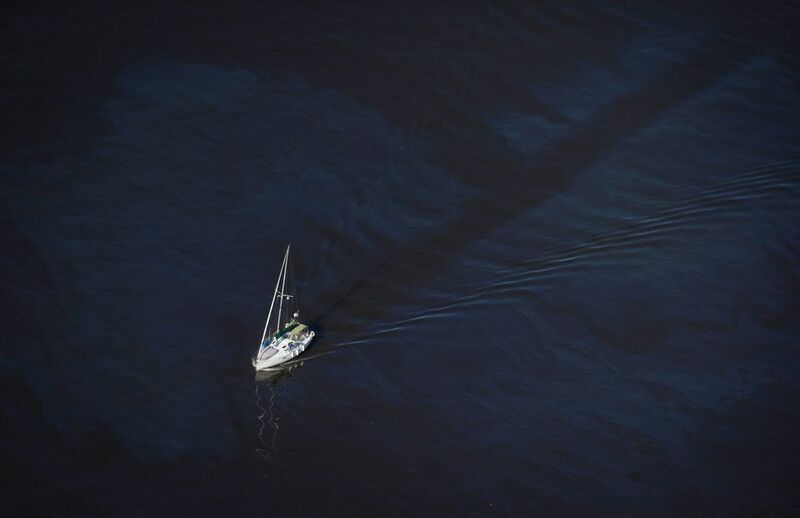 But Craig Minielly, commodore for the False Creek Yacht Club, said there was concern that oil could be swept in with the afternoon tide, putting the marina’s 115 boats at risk. Minielly questioned why the Coast Guard or Port Metro Vancouver didn’t alert the marinas of the spill, noting he could have put a notice out to boat owners before the tide came in overnight. He hopes the Coast Guard and city officials have since come up with a response plan that would protect the local marinas, especially given that oil has already been spotted on local beaches. Steve Keenan was out for his weekly paddling practice in English Bay Wednesday night when he got a faint whiff of oil about a kilometer from Siwash Rock. 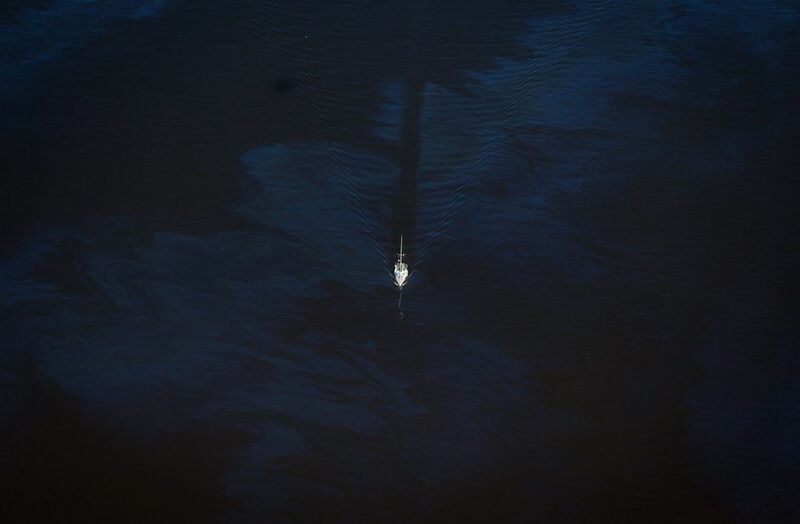 “You could smell a petroleum product and see a sheen in the water,” he said. “All around us there was just this film. Keenan used WD40 to clean his carbon fibre boat, but the group is still debating what to use to get the oil off the six-man fibreglass kayak. Transport Canada officials and the Canadian Coast Guard have officials at the scene. The investigation and clean up efforts are expected to continue Thursday. Vancouver city officials and Vancouver police are also responding to the scene. The Vancouver Aquarium and Marine Science Centre also said it would closely monitor the spill to determine whether it will affect aquatic species. Spokeswoman Deana Lancaster said the aquarium is sending a response team to ensure protection of any fish, seabirds and marine mammals that might be at risk, while Dr. Peter Ross was gathering samples at the local beaches. 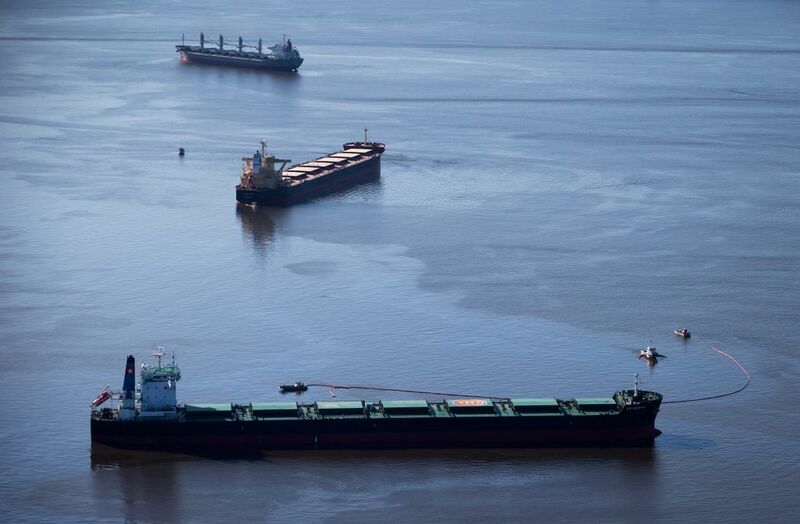 The size and scope of the spill have not yet been determined, but Ben West, spokesman for the environmental advocacy group Tanker Free BC, said the spill is a reminder of a “nightmare scenario” that could happen if there is increased tanker traffic along the B.C. coast. Greenpeace also said any oil spill is a disaster for marine life and for those who depend on a healthy ecosystem. “While we don’t know how big this toxic spill is and the damage is still being tallied, we do know it pales in comparison with what could happen if new tar sands pipelines were built to the B.C. coast or if Shell’s Arctic drilling plans were to proceed,” Jessica Wilson, head of Greenpeace Canada’s Arctic campaign, said in a statement. 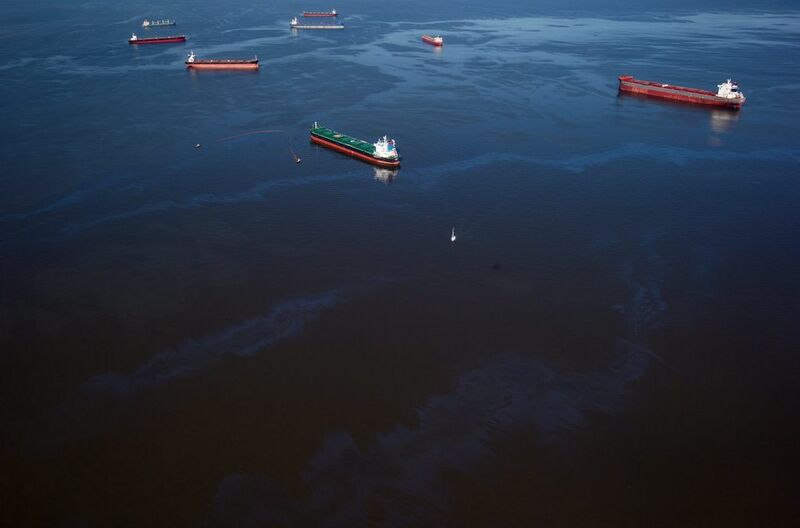 She noted this spill occurred in sheltered waters and with good weather conditions, while proposed pipelines would draw hundreds of oil supertankers through English Bay each year — often through storms and high seas.